Between the hiking mecca of Huaraz and the tourist hotspot of Cusco, lies an immense swathe of Peru’s Andean mountains — the Central Andes. These mountains reveal a less-travelled, more authentic side of Peru, where you can veer off the beaten path and travel back in time to a more traditional mode of life. Ayacucho is the Cusco that never was (or the Cusco of the future, depending on your perspective). This city, with captivating colonial churches and poignant museums, is a feast for the eyes — and the taste buds. Restaurants offer traditional local specialities, like puca picante, a stew with a picante peanut sauce. Within Ayacucho’s myriad secret courtyards are plenty of trendy bistros and boutique shops. There is also a sense of authenticity about the city that can seem absent in larger tourist destinations like Cusco. Trips even a few kilometres out into the countryside lead to little-visited remnants of Inca and Wari civilisations, while bumpy back roads slice through splendid sections of rocky altiplano (high-level plain) to communities that seldom, if ever, glimpse foreign travelers. Expert tip: Take the local bus to the Wari ruins 20km above Ayacucho, leaving from Paradero Magdalena at the eastern end of Cáceres. Huancayo is the most important city in the Central Andes, and is famed as a base for visiting the nearby Río Mantaro valley, where time-warped communities produce some of South America’s most high-quality handicrafts. Many of these crafts can be purchased in the city’s famous markets, which offer intriguing insights into the quirks and colour of Andean commerce. Two scintillating rail journeys also begin here. The world’s second-highest train line scales the mountains west to Lima, and another train plies south to the hauntingly beautiful 16th century city of Huancavelica. 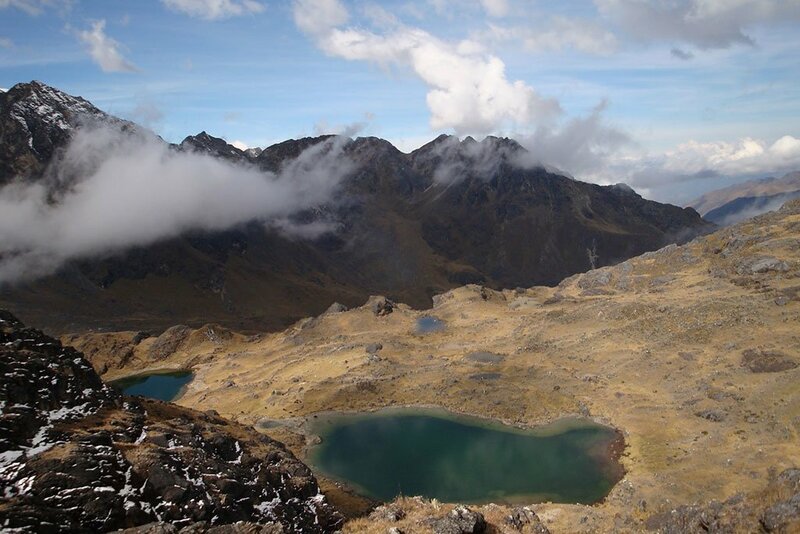 Huancayo is growing in stature as a hiking centre too: treks include the glacier of Huaytapallana and the lofty rock formations of Torre Torre. 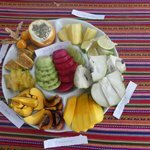 Expert tip: Journey out to Ahuac on the derecha (right-hand) side of the Río Mantaro valley, from where you can hike up to the mountain lake, Laguna Ñahuimpuquio, and on again to some pre-Inca ruins on the ridge above. The left side of the wide, verdant Río Mantaro valley northwest of Huancayo is renowned for its handicraft production centres, but there is another major attraction that does not often get talked about. The extraordinary beacon of learning that is the Santa Rosa de Ocopa convent stands one hour north of Huancayo, on the Jauja road. It was constructed in the 18th century by the Franciscans and features some important colonial art, as well as a delightful library with thousands of texts dating back over five hundred years. Expert tip: It is possible to do a day trip from Huancayo to the Santa Rosa de Ocopa convent and factor in visits to some of the crafts villages such as San Jerónimo de Tunán (known for silverwork) or Cochas Grande (known for the production of decorative gourds). Three hours south of Huancayo, Huancavelica is one of the most spellbinding colonial settlements in the entire Andes. Its many 16th and 17th century churches exhibit much of the silver the area was formerly famous for, and there are thermal springs in the vicinity. Many aspects of life continue in this little city as they have for centuries, thanks to the high concentration of indigenous Quechua people. The strong Quechua presence here also means many magical festivals occur throughout the year. Expert tip: Hike south of Huancavelica up to the abandoned mines of Santa Barbara, from where there are stupendous views of the whole district. This dizzyingly high (4333m) mining centre might be far from the most attractive locale in the Andes but it is one of the most fascinating. Three hours south of Huánuco, the city exemplifies the conflict between the traditional and the modern in South America. A mining boom has pulled many locals here out of poverty, yet thrust quality of life into jeopardy as pollution rates rise and the whole city teeters on the brink of collapse into the gaping hole of its main mine shaft. Outside town, the eerie bosque de piedras (stone forest) of Santuario Nacional Huayllay awaits, where immense towers of rock twisting dramatically into zoomorphic shapes such as alpacas and elephants. Expert tip: For a memorable do-it-yourself adventure, approach Santuario Nacional Huayllay via the back road from Lima through Canta and Obrajillo. Heading southeast from Huaraz, the small town of La Unión is the first place you reach in the Central Andes region after five hours of spine-jolting bus travel. It is five hours farther southeast from here to Huánuco. An ultra-traditional community that see very few tourists, it is a jump-off point for one of the most impressive ancient ruins in Peru, Huánuco Viejo. This vast Inca settlement, covering over 2 sq km, occupies a barren rise two hours’ tough hike above La Unión. Expert tip: Make the three-hour trip from La Unión up to still-more traditional Tantamayo from where you can visit two major sites of the pre-Inca Yarowilca culture, Susupillo and Piruro. Tingo María and Huánuco in the north of the Central Andes have airports, as does Ayacucho in the south of this region. LC Peru provides direct daily flights between each of these cities and Lima. 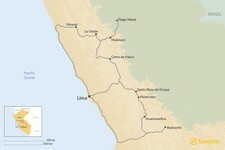 However, the region is typically reached by bus, and the cities of Tarma and Huancayo have the quickest and most frequent connections to Lima: respectively six and nine hours’ journey from the Peruvian capital. Travel around the Central Andes is typically by bus and this is the best way to gain an insight into the local culture. 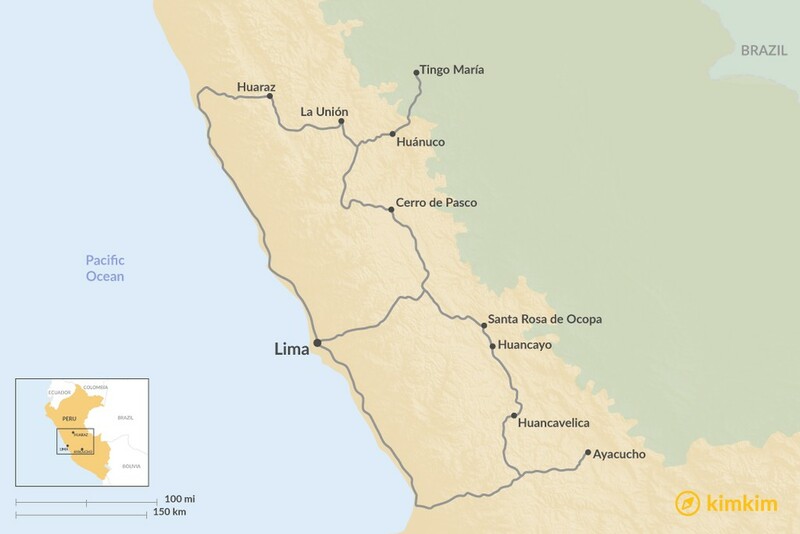 Trains connect Lima with Huancayo sporadically, and Huancayo with Huancavelica several times per week.